Nell is twenty-six and has never been to Paris. She’s never even been on a romantic weekend From the #1 New York Times bestselling author of Me Before You and After You, a sensational collection featuring the title novella and eight other stories. Quintessential Jojo Moyes, Paris for One and Other Stories is an irresistibly romantic collection filled with humor and heart. To ask other readers questions about Paris for One and Other Stories, please sign up. It says "timed for Christmas" does anyone know if these stories are Christmas themed? This book has nine stories about troubled relationships from the perspectives of the women in each. The first, Paris for One, is the length of a novella while the others are all short stories. I liked some more than others but really enjoyed them collectively. The narration performances were outstanding and contributed greatly to my overall reading experience. Below are short summaries of each with my reactions. Nell and her boyfriend Pete are off for a weekend in Paris, or so she t This book has nine stories about troubled relationships from the perspectives of the women in each. The first, Paris for One, is the length of a novella while the others are all short stories. I liked some more than others but really enjoyed them collectively. The narration performances were outstanding and contributed greatly to my overall reading experience. Below are short summaries of each with my reactions. Nell and her boyfriend Pete are off for a weekend in Paris, or so she thinks. Pete turns out to be a no-show and Nell decides to stay and experience the city of lights on her own. I actually loved this meandering and delightful story. Nell is such a straight arrow who steps outside of herself and turns a potentially crummy set of circumstances into a wonderful adventure. I enjoyed this immensely. This story about a PR nightmare has just the right touch of irony. Short but it hit the right notes. A woman's husband surprises her with a getaway vacation but it can't conjure up a bygone romance. This was so realistic it almost hurt but I loved the ending. A married woman encounters her former secret lover at a party and both have regrets they didn't even know they had. While this was not one of my favorites, it still was pretty interesting. A weary working mother and neglected wife has a pair of fantastic shoes transform her life overnight. This is one of my favorites, full of humor with a perfect ending. A woman working at a jewelry store has an encounter with one of the robbers of the place while it is in progress. This was my least favorite as it was a bit far fetched. Still, it was interesting. A married, working mother needs a new coat but the one she really wants is out of reach as they're struggling to make ends meet. It has a lovely and pertinent ending. A neglected married woman finds a cell phone and gets caught up in a texting relationship with a twist. This was touching and a bit sad though I got hooked through the end. A woman in a cold, dispassionate marriage is struggling to find the items on a Christmas list created by her husband for his mother. A fortunate ride in a taxi made this a really special story. Loved it. Paris for One is collection of two novellas and 9 short stories. My favorite story (or I should say novella) was Honeymoon in Paris. It is a standalone novella, but is also connected to Moyes' full lenght novel The Girl You Left Behind. 80 pages long, the story follows two couples placed in different time, separated by 80 years, who's stories together make a whole. Even though I really liked it, I think I would appreciate it even more if I have read the novel. Paris for One is second best in this Paris for One is collection of two novellas and 9 short stories. Paris for One is second best in this collection. It is fun and easy to read, but I think it would be better if the story was set in 90's, because characters were really bad when it comes to communication. If there were no mobile phones, the story would make more sense. Other two stories that I really enjoyed were Between the Tweets and Crocodile Shoes. As for other pieces, I think they were put into this collection just for sake of having enough stories for the whole bind up. Some were forgetable (Love in the Afternoon), some were there so Jojo Moyes' fans would have something new to read, and one was so.... silly and ridiculous (I don't mean it in a good way). The story I'm talking about is Holdups. I really didn't like that one. I don't want to sound rude here, but I'll say this anyway: some stories sounded like someone's practice writing, so I couldn't help but wonder if they were written before Moyes found her voice, before she became a successful writer. To be fair, when it all comes down together, I think three stars rating is realistic. I would recommend this collection to fans of Jojo Moyes. If you haven't read anything by her before, and you come upon this book, I would still recommend four stories I mentioned as my favorites. It would be a shame not to read them, if you already have a chance to do so. 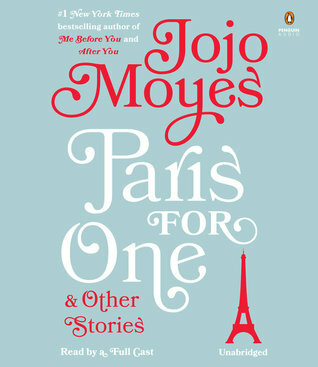 Paris for One and Other Stories is a collection of short stories written by Jojo Moyes. In my opinion, most all of the stories are entertaining and engaging, although some were more enjoyable than others for me personally. Fans of women's fiction will surely be able to connect with a few if not most of the pieces. It's a great collection. Check it out! Paris for One and Other Stories includes the following titles. The ratings and mini reviews are based on my personal enjoyment and reflect my opin Paris for One and Other Stories is a collection of short stories written by Jojo Moyes. In my opinion, most all of the stories are entertaining and engaging, although some were more enjoyable than others for me personally. Fans of women's fiction will surely be able to connect with a few if not most of the pieces. It's a great collection. Check it out! Paris for One and Other Stories includes the following titles. The ratings and mini reviews are based on my personal enjoyment and reflect my opinion only. This novella is takes up over half the book and felt like a thorough open and close story. I enjoyed it and clearly felt the Paris setting and the heroine's emotions. This was a good one. A bit of mystery with a surprise plot twist... and very surprise ending. I probably should have seen it all coming but I really didn't. Enjoyable! Hands down, my favorite out of the bunch. We take each other for granted much too easily and our contributions become a mundane expectation instead of a thankful appreciation. Loved it! The grass is always greener on the other side. Yeah right. Glad to see a change of heart. A fabulous pair of shoes can change your life. Loved this one! So Ms. Moyes has a borderline dark side! This one surprised me in a good way! I listened to this one twice and still can't tell you what it was about. Busted! Unfortunately, I didn't find this one all that enjoyable. I originally read Paris for One about 2 years ago. I rated it 4 stars and I thought it was a good short story. I was impressed by the fact that it focused more on a connection between two people rather than force some kind of insta-love. I didn't enjoy it as much this time, I don't know if that is to do with the fact that my tastes have changed or because I wasn't reading it for the first time. I think it was the former and I do think my tastes have changed slightly, but I rated it 3.5 stars thi I originally read Paris for One about 2 years ago. I rated it 4 stars and I thought it was a good short story. I was impressed by the fact that it focused more on a connection between two people rather than force some kind of insta-love. I didn't enjoy it as much this time, I don't know if that is to do with the fact that my tastes have changed or because I wasn't reading it for the first time. I think it was the former and I do think my tastes have changed slightly, but I rated it 3.5 stars this time (which isn't that much of a change to the rating but my feelings towards it have definitely changed). So it is a cute story overall but kind of lacking. I found most of the other stories to be lacking too. I really enjoyed Holdups (I gave it a 4.5). That story was very entertaining and different, it was also a bit far-fetched but I indulged it. A Bird in the Hand was the second best, getting 4 stars from me but the rest were all very underwhelming. That is why this book amounted to 3 stars. I hate to be mean but it feels like a money grab to me. Es el primer libro de esta colección y ocupa la París para una y otras historias es una colección de cuentos de Jojo Moyes. A lo largo de este último años he leído la mayoría de sus novelas y cada novela es única y siempre me cuesta calificarlas. Los personajes principales son siempre interesantes, los elementos románticos son tiernos y cargados emocionalmente y las mujeres bien construidas; cada una de las mujeres de las historias eran memorables, interesantes y únicas. Jojo Moyes is known for her engaging books that look at romantic relationships with insight and humor. This is a collection of nine contemporary stories. After reading weeks of depressing political commentary in the newspapers lately, it was fun to escape to this light, entertaining book. It was just what I needed! This is my first book by Jojo it was a fun read with some great stories. Each short story is very different. However they feature romance, some humour, breakups, secret love affairs, a little mystery and lots of different emotions. They give a portrayal of life and the problems women face within marriage and relationships. Not every story is written with a happy ending. Paris for one is the main story and it literally is what it says.... Nell embarks on a trip with her boyfriend... only he doesn't turn up...leaving poor Nell alone.... She shows so much strength when she decides to go to Paris alone, who knows what exciting encounters Paris has to offer! There are 8 other short stories included is this delightful collection. Some very good, others are just ok. But that's ok as not all stories are to everyone's taste. For this reason I chose not to list the ones I particularly liked as I feel it's only fair you read them with a fresh look. Overall a delightful and different collection. Last summer, I attempted to read my first Jojo Moyes' book, Windfallen, and quit after about 60 pages in because of the writing style. I decided to give her writing another go with Paris for One and Other Stories, but, sadly, I felt much the same about these short stories. I enjoyed Paris for One fairly well, but the other stories were somewhat irritating and forgettable. I was hoping I'd like this more, and I still plan to read Me Before You and After You, but this was a miss for me. La historia de Nell y Fabien es muy linda!!! Paris for One and Other Stories was a charming and touching collection of short stories involving troubled relationships. Each story had such a strong and dynamic voice. I felt like each narrator was so distinct and well developed for having such short stories. I loved the way the author wrote the stories and how each story was unique and memorable. I knew I loved JoJo's writing style, but this book just reminded me of how much I truly loved it! I liked some of the stories more than others, but Paris for One and Other Stories was a charming and touching collection of short stories involving troubled relationships. Each story had such a strong and dynamic voice. I felt like each narrator was so distinct and well developed for having such short stories. I loved the way the author wrote the stories and how each story was unique and memorable. I knew I loved JoJo's writing style, but this book just reminded me of how much I truly loved it! I liked some of the stories more than others, but I really enjoyed this collection overall. This story was actually my favorite of the collection and it was the longest! I loved the two main characters in this story, especially Nell. I saw so much of myself in Nell and I was rooting for her to have the trip of her life. I was invested in this story from the first page and shipped the two main characters SO HARD. I LOVE THEM TOGETHER. The Paris setting added such an enchanting and wonderful element to the story. I seriously adored this story and the adventure the characters went on. I WISH THIS WAS A FULL-LENGTH NOVEL. NOW NEED TO GO TO PARIS AND DISCOVER MYSELF. This was an extremely short story, but I still found it very interesting and addictive! It proved how lies can really hurt your reputation. This might not have been one of my favorite stories, but I still enjoyed it. I found this short story to be a very realistic look into romance in marriages. This story and the characters tugged at my heartstrings and I loved the way it ended. This story involved ex-lovers running into each other and discussing some of the regrets they had in regards to their relationship. I found this story to be very well written, but it was not one of my favorite stories in this book. This story took the old saying "one pair of shoes can change your life" to heart! When a woman finds a pair of killer heels, it turned her not so fabulous life upside down! I thought this story was hilarious and oh so charming! While working at a jewelry store, a woman had an interesting encounter with a robber. Even if the events seemed a bit ridiculous, the character interactions were well written! The ending put a smile on my face, even if it seemed crazy. This was such a realistic and emotional story. I felt like the author touched on such a relevant and relatable topic in regards to struggling to make ends meet. The ending made me feel ALL THE FEELS! ADORABLE! This story was such an emotional roller coaster! Even though I had a feeling things wouldn't end up well, I was invested in the story and the characters. AHHH! This story was so heartwarming and precious. The character interactions in this story were precious and made for such a memorable novella. Overall, Paris for One and Other Stories was a fun, charming, and easy read! I would recommend this book to everyone. 'Paris for One and Other Stories,' is a collection of eleven romantic shorts with JoJo Moyes the headline author and writer of the main title. Paris for One offers easy, light romantic reading and is my first outing with this author. I was highly anticipating that I would enjoy the writing style but unfortunately, for my personal taste, it was lacking the power in the prose to engage my attention or convincingly draw me into the story. I found myself disengaged from the characters and felt some elements were a little too convenient, perhaps a touch contrived rather than organically drawn from the narrative and sadly this affected my overall enjoyment of the piece. 'A Bird in the Hand,' is the stand out story for me and engaged my attention more than the others, however even this had a slight abrupt ending. I confess that I stopped reading after the seventh story, I may go back to the remaining romances when I need a romantic short over a lunch hour but at this stage I was finding the shorts to be of a similar ilk and not really working for my reading tastes. NOTE: My rating is based on reading the first 7 of 11 short stories. I don't usually like short stories, but this collection was very enjoyable. It was satisfying to read the stories during my commute to work. The book ended appropriately with a short Christmas story. Total chick lit, but good! 5 estrellas para “París para uno”, que me ha dejado encantada y con unas ganas inmensas de ir a París. Le bajo una estrella por los demás relatos, los que no me parecieron del todo geniales. El primer relato y más extenso, cuenta una historia bastante original y dinámica en la que no dejan de suceder cosas y atrapa desde el primer capítulo. Quizá su corta extensión sea el principal motivo de que todo avance a un buen ritmo. En este relato se mezcla el romanticismo con algo de humor en ciertos momentos que hacen de él una mezcla bastante interesante. El segundo gran relato (después de varios cortos) nos muestra dos historias separadas por muchos años pero con un nexo en común bastante importante. En ella podemos ver cómo se afronta una situación similar en dos épocas tan diferentes. Quizá a los que habéis leído "La chica que dejaste atrás" os suenen de algo los personajes. Y ahí lo dejo. Respecto a los demás relatos, dada su corta extensión, no tienen la misma magia que los dos largos aunque son bastante entretenidos y alguno de ellos incluso divertido por su trama o por el final inesperado. Todos los relatos guardan una pequeña lección sobre el amor, tratando a lo largo de sus páginas muchas de las diferentes etapas que se afrontan, incluidos también, el desamor o la falta de ilusión en una pareja. Es un libro que recomiendo sobre todo en épocas en las que no os apetece leer una novela como tal y preferís leer pequeñas historias de una manera más rápida. No es el mejor de Jojo Moyes ni mucho menos, pero en parte creo que se debe a que un libro formado por relatos no va a conquistar de la misma manera que lo haría una gran novela. Easy, fun read.. Makes me want to drop everything and go to Paris! This is my first book by this author. This book starts with the novella Paris for One - I think of it as a novella as most short stories don't have chapters. I really liked Paris for One. The writing is so open and engaging that I read this novella of 100+ pages in one sitting. Great female characters and not all the men were worthless. Very enjoyable. The other stories in the collection are darling. Some remind me of stories by O. Henry. The women are very real. The stories are lighthearted with This is my first book by this author. This book starts with the novella Paris for One - I think of it as a novella as most short stories don't have chapters. Lindo relato corto, me hubiera gustado saber un poco más porque la historia que cuenta, si bien, es bastante típica, esta linda! No sé como he sido capaz de terminar esto. Al principio estaba haciendo reseñas individuales de cada relato, hasta que me di cuenta que era estúpido. El único que se salva es el primer relato, el resto no son más que mujeres inseguras haciendo algo. Algo estúpido, generalmente. O algo irreal, que no ocurriría jamás. Ah, o arrastrándose detrás de sus novios/maridos. This was my first encounter with JoJo Moyes writing and I have to confess that I was somewhat reluctant after reading all the angsty and teary-eyed reviews of Me Before You. I'm a chicken about really heartwrenching stories so I held back. But then I spotted this short story collection and thought it might be safe enough. Well, I made a good call I think, but not because Paris For One was devoid of angst. No, this was a fantastic collection that gave me an idea of the writing gift the author dis This was my first encounter with JoJo Moyes writing and I have to confess that I was somewhat reluctant after reading all the angsty and teary-eyed reviews of Me Before You. I'm a chicken about really heartwrenching stories so I held back. But then I spotted this short story collection and thought it might be safe enough. Well, I made a good call I think, but not because Paris For One was devoid of angst. No, this was a fantastic collection that gave me an idea of the writing gift the author displays, her talent for going deep in an economy of pages, and gave me so many lovely story gems all in one volume. I might just be brave (read greedy for more, there) enough to pick up more of her books. So... Paris For One and Other Stories. There were nine stories total including Paris For One which is a novella and the others as short stories. Each showed a different facet of love and life all from each heroine's perspective only: a young woman ditched by her boyfriend to do Paris alone, rekindling the romance for a middle-aged couple, a new chance at the road not taken (aka former lover vs husband), a woman finding her mojo when she finds some killer shoes, shop girl flirts with robber during hold up, finding contentment in a material world, an infidelity accusation backfires, a two-week pretend life for a bored woman, and a woman who sees her life clearly while on a hunt to fulfill her Christmas list. They were all good in their own ways and I could see the appeal hitting me differently if I read these in different moods because they hit all facets of womens' lives and feelings. I enjoyed the most, Paris For One as a girl who never took a step without making a list learns to take chances now and then and finds her confidence, but also thought Hold Up was a hoot, Crocodile Shoes made me root hard for the heroine and Last Year's Coat resonated with me the most, I think, because this woman struggled hard with every day issues. And, I think that was the appeal of each story. All these gals were every day women that I recognized in myself or others I know. They were familiar, but yet they had new experiences. This book brought out my emotions, but also left me musing afterward. All in all, I was well satisfied with this collection of shorts and definitely want to try her novel-length books. These are definitely for those who enjoy women's fiction and chic lit. If I was rating this book just on the short story Paris for One, it would easily be four stars. While I really enjoyed Nell’s story, I did find the synopsis to be a bit misleading. Nell doesn’t take the plunge and go on her mini-vacation alone. She heads to Paris assuming her boyfriend will be arriving shortly thereafter. He doesn’t show up, and through a series of events, she finds herself staying in Paris (as the title suggests,) alone. I found it really easy to ARC from the publisher. This is the sign of authorial success: Being allowed to publish a bunch of stories you wrote during puberty and having it sell well. Under-edited and under-whelming, Paris for One & Other Stories definitely strikes me as the sort of slap-dash work authors often get away with publishing after becoming a success. The sort of stories that make you wonder if they were written B.S. (Before Success) or A.T.W.D (After the Wells Ran Dry). Either way, the definitely feel like a collection published so This is the sign of authorial success: Being allowed to publish a bunch of stories you wrote during puberty and having it sell well. Under-edited and under-whelming, Paris for One & Other Stories definitely strikes me as the sort of slap-dash work authors often get away with publishing after becoming a success. The sort of stories that make you wonder if they were written B.S. (Before Success) or A.T.W.D (After the Wells Ran Dry). Either way, the definitely feel like a collection published solely out of a need to put something new on the shelves. A "between times" book to fill the space between big hits. While there's not a lot of creativity in any of these stories and none of Jojo Moyes brilliant signature characters, if you already love Jojo Moyes, this book won't change your mind about her. If you've never read Jojo Moyes before, DON'T READ THIS BOOK FIRST. The main story, Paris for One, reminds me of a B chick flick. It pulls out all the usual stops: a woman afraid of excitement who finds herself alone in a strange city, a waiter/aspiring writer who is afraid to dream, an oblivious and selfish ex-boyfriend, Paris at night... Nothing in it will make you see things in a new way or surprise you, but if you're look for a very quick, reliably romantic read, it'll do the trick. Of the "Other Stories," the only one that held any twist and made me laugh was Between Tweets. The rest are pretty much shorter versions of the same caliber writing as Paris for One. París para uno y otras historias es Jojo Moyes en estado puro, y creo que no hay mejor alago que ese. Pese a que me ha faltado más de algunas historias, ha sido una muy buena lectura si lo analizo desde una visión global. A special thank you Penguin/Viking and NetGalley for an ARC in exchange for an honest review. JoJo Moyes returns following After You (Me Before You, #2) with a romantic and entertaining novella PARIS FOR ONE AND OTHER STORIES. Nell is excited while waiting to take the train to highly-anticipated Paris when texting her boyfriend. He is not going to make it! He will meet up with her later (possibly). Shocked and angry, this was supposed to be a romantic getaway and h A special thank you Penguin/Viking and NetGalley for an ARC in exchange for an honest review. Nell is excited while waiting to take the train to highly-anticipated Paris when texting her boyfriend. He is not going to make it! He will meet up with her later (possibly). Shocked and angry, this was supposed to be a romantic getaway and her first visit to enchanting Paris. At age twenty-six, Nell Simmons has never even been away for a weekend with a boyfriend, much less a trip by herself. Solo. When arriving at the hotel, they have overbooked the rooms. She decides she will let nothing interfere with her trip. Until she realizes her boyfriend is not coming, and she is stuck rooming with another woman she does not know. A rude American woman, at that. The Frenchwoman at the reception desk is of little help. One room, twin beds, or a refund. Things are not starting out too well. So much for the new underwear and the painted toenails. She has been stood up! If she had, to be honest, he was an unreliable boyfriend, period. She could go back to England; however, she is unlikely to get a train this late. She will return the following day. However, she decides to go out for a bite to eat. She is trying to live in the moment. She usually plays it safe. No risk taking. Upon returning to the hotel, the two women find they are not their ideal choice, of sleeping companions; fighting in a small space. However, the following day things change. The new ticket will cost too much to return home. She will have to look at all the happy couples. Now she hates Paris. Until she discovers two tickets to an art gallery show by an artist she has vaguely heard of. They must have belonged to the American woman, whom she has found out has left. (her luck may be changing). The front desk says she should go. Maybe she will. After a little shopping to be more “Tres chic” Parisian, and she is ready to go out with a Frenchman she picked up at an art gallery. With some chances and a witty list of “reasons to stay in tonight,” Paris turns out to be more than delightful! For the first time, she, Nell the careful girl from England is whomever she chooses to be. From mistakes, being impulsive, to chance encounters. A magical Christmas novella of a girl who finds herself alone in Paris, but not for long! Along with other women in the following stories with unsatisfying relationships- find themselves trying out new identities, and different situations with a twist. With Moyes’ own signature style- always lots of wit, mischief, charm, and holiday cheer. Paris for One and Other Stories by Jojo Moyes - 2 stars. Let me start by saying I ADORE Jojo Moyes and this is the main reason I requested this ARC when I am not a fan of short stories. If anyone could whisk me away into another world with few words it would be Moyes, unfortunately even she could not make this happen. Some of the short stories I didn't understand and others left me feeling "bleugh" or were very bland. Only one managed to capture my attention and draw me to the characters and tha Paris for One and Other Stories by Jojo Moyes - 2 stars. Some of the short stories I didn't understand and others left me feeling "bleugh" or were very bland. Only one managed to capture my attention and draw me to the characters and that was 'Paris for one', however, even then it was like reading an excerpt for a book. It didn't feel like a completed story. I wanted more! If it was a full length book it could of been wonderful. So I have learned, short stories are not for me regardless of the author and I would recommend sticking to completed novels if others feel the same. What an amazing book. It's the first collection of short stories that I've loved every story. Jojo Moyes outdoes herself with this novella and and 8 short stories. The novella, Paris for One is great, about a young woman discovering she can be responsible for her own happiness and doesn't need to kowtow to a boyfriend who thinks only of himself. All the others are quick reads that are all about being happy. Great read and will be a perfect stocking stuffer since it's due out mid-October. En general, me ha gustado mucho. Consta de 11 relatos, todos cortitos menos el primero que es más largo y que ha sido el que más he disfrutado. Un libro muy entretenido, bonito, ligero y fácil de leer.